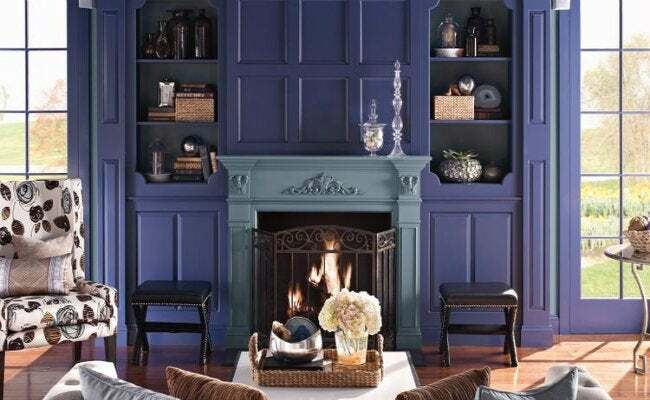 Bob Vila’s Fall Paint Give-Away Starts TODAY! Enter today and every day in September for your best chance to win 16 gallons of BEHR MARQUEE® Interior or Exterior paints. With cool and crisp weather on the way, September returns us home from summer vacations and places far flung, so we partnered with BEHR® to help you repaint your abode, inside or out! This month, four lucky winners will each receive 16 gallons of BEHR MARQUEE® Interior or Exterior paint—a give-away totaling $3,000 in prizes! What would you do if you won? Whether you’d reinvent your living room or revitalize your home’s curb appeal, now’s the time to enter. • With its One Coat Color Collection Guarantee*, BEHR MARQUEE® Interior paint and primer covers stains, porous surfaces, and wood with only one coat. • Advanced fade protection technology and dirt- and mildew-resistant finishes keep BEHR MARQUEE® Exterior paint looking fresh longer. 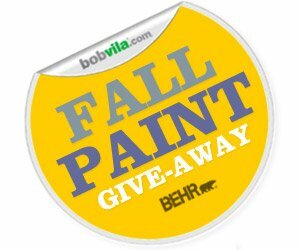 Enter Bob Vila’s Fall Paint Give-Away daily to increase your odds of winning up to 16 gallons of BEHR MARQUEE® Interior or Exterior paint. To learn more about BEHR MARQUEE® paints, click here. The “Bob Vila’s Fall Paint Give-Away” is open only to permanent legal U.S. residents of the 50 states and the District of Columbia. Void in all other geographic locations. No purchase necessary. Void where prohibited. Contest Period for Weekly Prizes runs from 12:00 p.m. (EST) EST Sunday, August 31st, 2014 through 11:59 am Tuesday, September 30th, 2014. One entry per household per day on BobVila.com. Alternative means of entry for Drawing is available by faxing your name and address to 508-437-8486 during the applicable Entry Period. Odds of winning depend on the number of eligible entries received. By entering, all entrants agree to the Official Rules.